Throughout the 1880s, the brewing industry in America was engaged in a decade-long surge in plant expansions and mechanization. Enormous amounts of capital were expended in anticipation of the future prosperity of brewing. But, by the end of the decade, it was becoming apparent that industry-wide brewing capacity had grown at a much faster pace than had actual beer consumption. 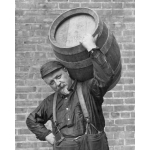 And the unforeseen economic downturn of the early 1890s -- which resulted in a nationwide drop in beer sales of about one million barrels in a single year -- only worsened the situation. Countless brewers who had mortgaged their future to take part in the expansion frenzy of the 1880s now found themselves in financial panic. A number of such distraught brewers found relief from an unlikely source: British investors. Driven abroad by economic troubles in their own country, British financiers began injecting capital into a variety of U.S. industries. Interest in the brewing industry was particularly strong, spurred largely by the fact that a number of major European brewers had, for the first time, made public stock offerings during the late 1880s. Demand for the stocks (among them Bass and Guinness) was said to have far outweighed the supply. Many eager investors unable to secure any of the scarce European brewery stock turned their attentions to brewing in America. Already by the early 1890s, British investors had spent some ninety million dollars acquiring about eighty U.S. breweries in cities throughout the country. But rather than buying on a single brewery basis, the British usually sought to gain control of a majority of the breweries in a given city or region. A stock company would then be formed, and the breweries operated as a single entity. The financiers typically offered hugely inflated prices to brewery owners in order to take in as many of the local breweries as possible. While British-owned brewery conglomerates operated in Baltimore, Chicago, Detroit, Boston, Philadelphia and a host of other cities, the British never succeeded in "landing the really big fish," as one historian put it. For example, despite securing the purchase of 18 breweries in St. Louis, the British were unable to lure the city's two biggest -- William Lemp and Anheuser-Busch. (The latter was offered $8 million.) Likewise, in 1889, British speculators put together a plan to consolidate all of the Milwaukee breweries. But, after much speculation, both Pabst and Schlitz refused to take part, and the deal was never consummated. The last few years of the nineteenth century were not favorable ones for the American brewing industry. The Spanish-American War resulted in a doubling of the federal beer tax, and nationwide consumption dropped off sharply. Many of the foreign investors who had acquired breweries in America were severely crippled by the industry's slump. Most had grossly over-paid for their plants and were now liquidating their brewery properties at a fraction of their initial investments. In the end, the British disappeared from the American brewing scene nearly as quickly as they arrived. Copyright 1997 Carl H. Miller.